Alexander Tilloch Galt was one of the most influential politicians of his time. His role was most prominent during the constitutional conferences; he was involved in the issue of economic development and was committed to defending the rights of religious minorities. These things together made him truly one of the Fathers of Confederation. In 1824, Alexander's father John Galt founded the Canada Company a settlement company active in the area of Lake Huron and laid the groundwork for the city of Guelph, Ontario. It was during this time that the young Alexander first came to Canada, in 1828. He remained for two years. Despite the failure of the Canada Company, John Galt helped found the British American Land Company in 1834 and arranged for his son to be taken on as a clerk in the Sherbrooke office. Thus, in 1835, Alexander Tilloch Galt returned to Canada for the second time. In 1840, he drafted a report on the company's successes and failures, and the document made its way to London. Galt had made an impression: in October 1843, the London office made him secretary of the British American Land Company and, in 1844, he was named commissioner. Galt's first foray into politics was short-lived. It was in 1853 that he made his real political début. He would remain active in Canadian politics until 1872. Early in his career, Galt could have been considered a supporter of the"parti rouge", which favoured the abolition of seigneurial tenure, the secularization of clergy land reserves, secret ballot elections, and the separation of Church and State. Nonetheless, the remainder of his career would clearly show him to be a Conservative, first and foremost. When the government was dissolved in 1858, Governor General Edmund Walker Head asked Alexander Galt to form a new government. He refused, but suggested the job be given to George-Étienne Cartier, who agreed to form the new government with John A. Macdonald. Galt became inspector general (finance minister of the time). Galt's agreement to join the government was conditional on the serious consideration of a project to federate the British North American colonies. In October 1858, supported by the governor, Alexander Tilloch Galt, George-Étienne Cartier and John Ross travelled to London to present their proposal to Queen Victoria. The project was received with polite indifference and was then shelved until 1863. In 1863, the Macdonald-Taché government had a House majority, and a parliamentary committee was created to study the political restructuring of the colony. After another change in government, the Great Coalition was formed in 1864 and the confederation process got going in earnest. Galt participated in the conferences in Charlottetown, Québec and London. He was among those who helped organize the new country's administration, and championed the right to education for the Protestant minority in Quebec. 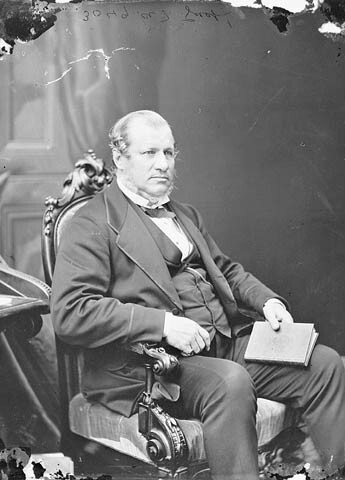 In 1866, Galt resigned from Cabinet when most Upper Canadian politicians opposed the same rights for the Catholic minority in their province. His contribution was too great to be ignored, however; when the final constitution was drafted, the right to education for religious minorities was in place for all provinces. Prime Minister Macdonald appointed Alexander Tilloch Galt to the position of finance minister in the first Cabinet of the Canadian Government, but he would hold this position for only a year. In 1867, the bankruptcy of the Commercial Bank of Kingston forced him to resign. He left active politics for good in 1872 over his disagreement with a number of government policies. The remainder of Galt's political career was spent as the Canadian government's representative abroad until 1883, when he returned to the business world. Chronic health problems late in life forced him to limit his activities after 1890. He died at home in Montréal on September 19, 1893. Kesteman, Jean-Pierre. "Galt, sir Alexander Tilloch." Dictionnaire biographique du Canada. Vol. XII. Québec : Presses de l'Université Laval, 1983. P. 378-387.